Nicholas is TEN YEARS OLD TODAY! First of all I thank my God and Nicholas’ for the course of his destiny that I get to say it’s Nicholas’ TENTH birthday on the 15th of March! Our lives have all been so deeply and profoundly affected by this little miracle man who I fall in love with more every single day. Nicholas is like no other. How could he be when his entrance was like no other? I cannot believe its ten years now. I never knew this day would come and never counted on it, but believed in it all the same, just as I see him at 29 playing cards with me golden sunlight dappling his hair. I believe with every fiber of my being that Nicholas was always supposed to be here for many reasons, not the least of which was to be a messenger, an unexpected guide, a wise teacher in the very meaning of life itself and how we, as humans, must have hope, must believe and most certainly must love and truly be grateful daily for every richness we are provided. I get more fan mail from “little man” than all my other projects put together. I believe it is because his magic touches everyone and his love and spirit allows for people, no matter what situation they are in, to feel and know hope. I saw first hand the effects of having faith and the power of prayer (whatever your prayer may be). I used to sing (badly!) my prayers to Nicholas over the isolette knowing he’d hear/feel my ode to his being through the thick plastic “Salad Bins.” (as some of us moms referred to the scientific incubators). Nicholas’ fans and peeps will be happy to know we’re putting together a downloadable booklet entitled “Love Letters to Nicholas” featuring letters to Nicholas from ALL over the world. These letters are truly amazing in their depth, their intimacy, their impact. Deeply profound letters from young girls and boys to elderly grandmothers of preemies or special needs children. They are STOP THE PRESSES letters, that make me stop whatever process I’m churning in to remember everything in my life that is so dear and precious and how so much of that is due to Nicholas. I don’t know how many people know it was Nicholas that played cupid to Marina and I meeting? If not for Nicholas we would not be together, would not have made two more films, would not enjoy this gigantic family with six kids a dog and a nurse!! “Love Letters to Nicholas” is in the process of being compiled and will be ready sometime late summer/early fall. And yes, “little man, Rainbows & Butterflies” (The Sequel’s working title) is already in pre-production, the last 8 years of footage being digitized….afterall, the cameras never stopped. Slowed down a bit, but he as well as the rest of our family remains one of the most photographed kids on the planet (Marina having been a celeb photographer and me being a filmmaker, well…the kids don’t stand a chance)! The sequel is for all the many folks who ask, without fail, how is he doing now? At Last – How is Nicholas Doing? In a nutshell, Nicholas looks like any other kid (well, I think he’s beautiful, delicate features, searing blue eyes and the longest lashes ever! Course you can’t ever see them because of his coke bottle glasses) but his life is very different. His intelligence is at times savant-esque, yet he operates at roughly a 2 ½ year old level. He has his own language, “Nicholese” – half is English, half is what we all believe to be a true language, we just haven’t found an interpreter yet. His sense of humor is timeless! He is one of the funniest kids I’ve ever been around. The reality is Nicholas still lives on monitors at night. He is still medically fragile, misses 75% of his school days and still requires 24/7 nursing. In every other way he is a little boy who wants to dig in the dirt, laughs hysterically at the splash of water he makes with his feet in a pool and tries like the dickens to get out of “Nite Nite,” luring me with one more kiss, one more snuggle. And who can say no to a child who is pure grace, tender gentleness (it makes my heart ache he’s so gentle with flower petals), spontaneous guffaws as he charms his way through your heart. Yes, he’s irresistible. People are drawn to him like a magnet. I and no one else can ever feel sorry for themselves around him, because being with him, REALLY being with him, is like getting your heart re-tuned, your soul generously nourished and your perspective reset to remember what’s important. If you ever want to learn, “live in the moment,” – that’s Nicholas. He is indelibly INSIDE every moment. Thank you again and check back for more! Thank you all, for the many letters, the many emails, FB’s and twitter posts on behalf of Nicholas and the family. We love and adore you… and look forward to you seeing all of Nicholas in his glory very soon. wow. a member of our Austin, Tx preemie babies facebook group posted for us to watch this movie today.. many of us did. and we then decided to look up how Nicholas was doing today. i was so shocked to realize today was his birthday. what a coincidence! id like to wish him a Happy Birthday from all of us here in Austin! You don’t know me, but I love you Big Man! Happy Birthday!!! Why do I love you? Because you give me strength, and courage, and happiness. You don’t know that in the NICU, the hands that touched you touched my daughter, Morgan Jewel. You don’t know that the blankets you laid on, cried on, smiled for the first time on- may have been the same blankets Morgan dwelt on a few years before. But you DO know the happiness of people that love you, and pray for you. 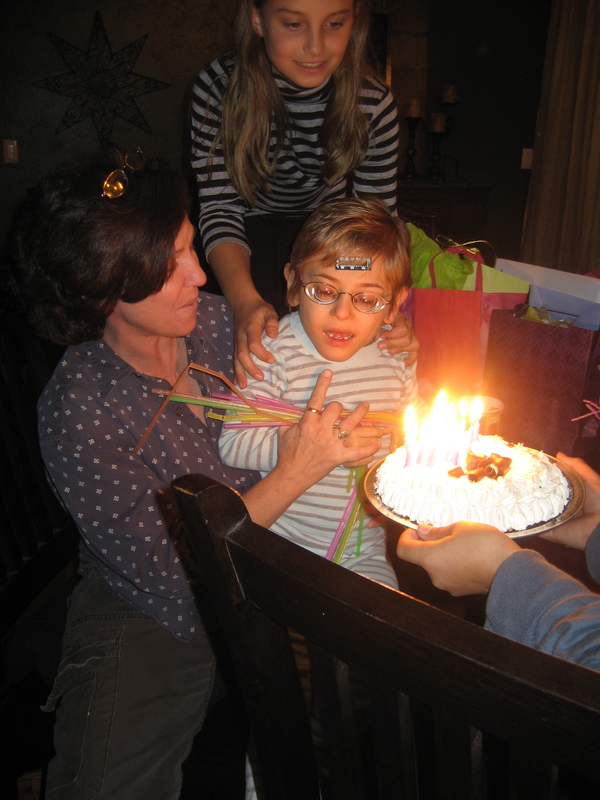 My 24 weeker, 1 lb 8 oz- born at Cedars-Sinai, a fellow preemie survivor and inspiration bids you happy birthday. And so do I. So proud of you and your Mommy!! Look how far you have come. . . HAPPY BIRTHDAY- what a blessing!! What a Journey! After a woe-is-me day, found Little Man on Netflix and settled in for what I thought would be a charming, inspirational movie. I had no idea how I would be moved by his story and what a tough little fighter Nicolas is! I was born in 1975 at 28 weeks, just above a lb. Like you my parents were told I wouldn’t make it and to not even bother naming me. Once I proved them wrong, they predicted I would never live on my own or get past a third grade education. Now 36 years later I am still doing my best to prove them wrong. A graduate degree, a military career, and four kids later, life is great and beautiful a crazy. I wish you and your family and wonderful life full of all the hope, love and joy you can cram into these precious years he was with our children!